If you’ve been using a computer in your family history research BACK UP YOUR FILES NOW. Just do it. Stop reading this blog and backup your computer. Then we can continue. Done it? Good. Feeling a bit more disaster-proof? Well you’re not quite there yet, because if you’re using proprietary genealogical software there’s another catastrophe that you’re also going to have to prepare for. What are you going to do when to the company that made your software goes bust? You won’t be getting any more support for what you’ve bought, and there won’t be any more updates and bug fixes and new versions with new features. The time will come when your old software won’t even run on newer operating systems. You’ll be stuck in the past, and this won’t be a comfortable place to find yourself, even for a genealogist. To prepare for this you’re going to have to practice, or at least get acquainted, with the task of exporting files to a neutral, non-proprietary format, then importing the data back into a genealogy program. What’s a ‘neutral etc etc’ format? ‘Plain text’, is the answer, ‘with a bit of marked-up structure to it’. The idea is that you dump out all your data into a plain text file. That file can then be imported, if necessary, into some other genealogy program. 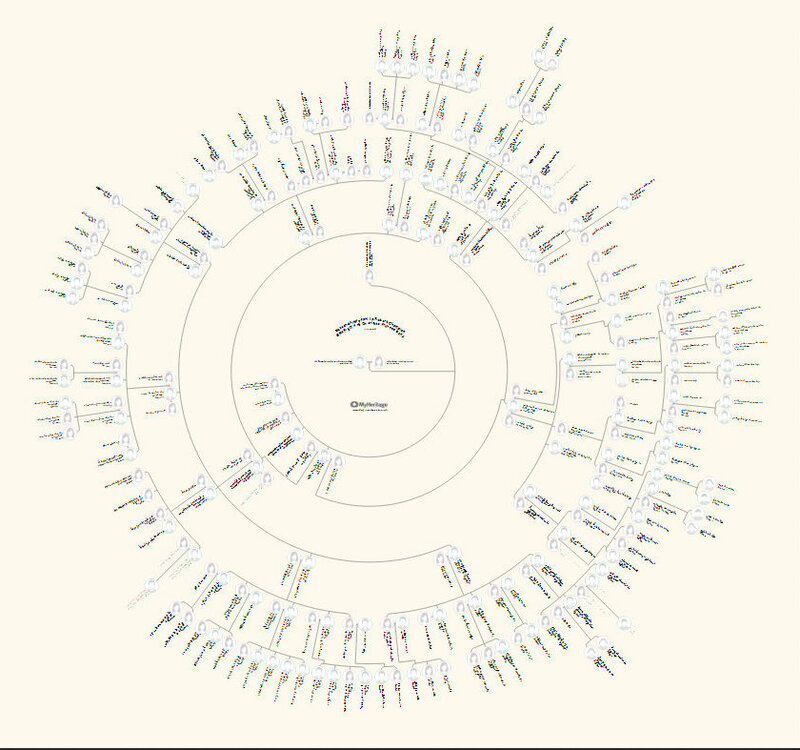 The most common structured plain-text format is GEDCOM (Genealogical Data Communication), which is (allegedly) compatible with every genealogy program ever devised. If you export your data as a GEDCOM you’ll be able to import it into other programs and into some websites. GEDCOM won’t do images, though. You’ll have to save them separately and import them by hand. Another, more up-to-date and more reliable plain-text format is XML. You can dump Blogger and WordPress sites as XML and import the data into a different site or different software. This is what I used to transfer from Blogger to WordPress. Don’t worry about the technicalities. Just remember that genealogy programs always have—or should have—an ‘export’ facility. Find it and give it a go, or anyway, read the documentation to see what it will do, or is meant to do. 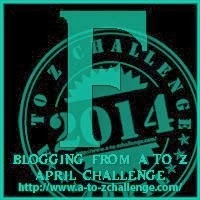 If you’re running a blog, think about having it included in an online archive of some kind. Have a look at PANDORA, for example, at pandora.nla.gov.au. It’s run by the National Library of Australia, and—a nice bonus—PANDORA-archived blogs are searched by the Library’s Trove system. If you’re Australian, PANDORA might be willing to archive your blog. They do mine. In Blogger choose “Settings” then “Other” then click on “Back up content”. This will generate an XML file. I used this XML file to transfer my blog to WordPress. You can import content into Blogger from an XML file by choosing “Import content”. You will need to scroll down to view the import and export options. You can import an XML file. When you export an XML file is generated. You can save the export as a backup of your website. The subject of yesterday’s post was the information about ethnicity said to be derivable from a person’s DNA, mine in this case. Today I thought I would look at the ethnicity conclusions extracted from my husband Greg’s DNA data to see whether these are consistent with what we know independently about his family tree: to see how Greg’s DNA ethnicity compares with his documented descent. I have enough tested matches between his known cousins and people with whom Greg shares DNA to be reasonably sure his paper-trail tree matches his genetic tree for several generations back. I know the birthplaces of all of Greg’s great-great grandparents. Twelve were born in England, two in Ireland, one in New Zealand of English parents, and the other in Australia of English parents. Most of his English forebears were from the south of England. There is no hint in what we know of their surnames, religion, or occupations to suggest that Greg’s great-great grandparents were recent migrants from outside the region. Greg’s mother, who believed that some of her Cornish ancestors had come from Spain, would have been very interested in this. 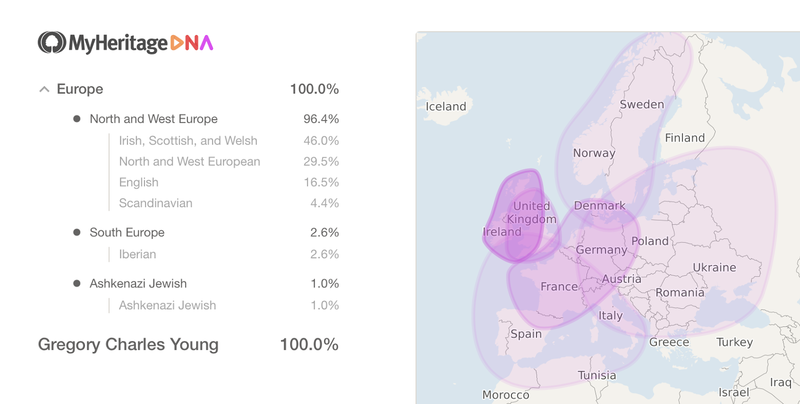 The ethnicity results seem to suggest that there was indeed an Iberian connection of some sort (though not necessarily through Cornwall). 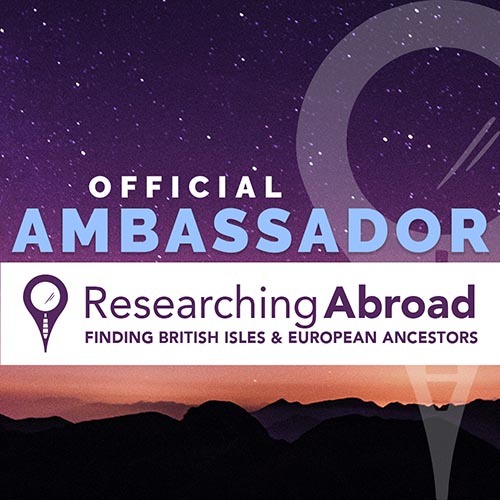 AncestryDNA has recently added a new feature, which it calls ‘Genetic Communities’. Ancestry predicts at the 95% confidence level that Greg belongs to the ‘Southern English Genetic Community’. This certainly matches his family tree. 71 people with whom Greg shares DNA, including Greg’s first cousin, several second cousins, and known third cousins, have also been linked to the Southern English Genetic Community. 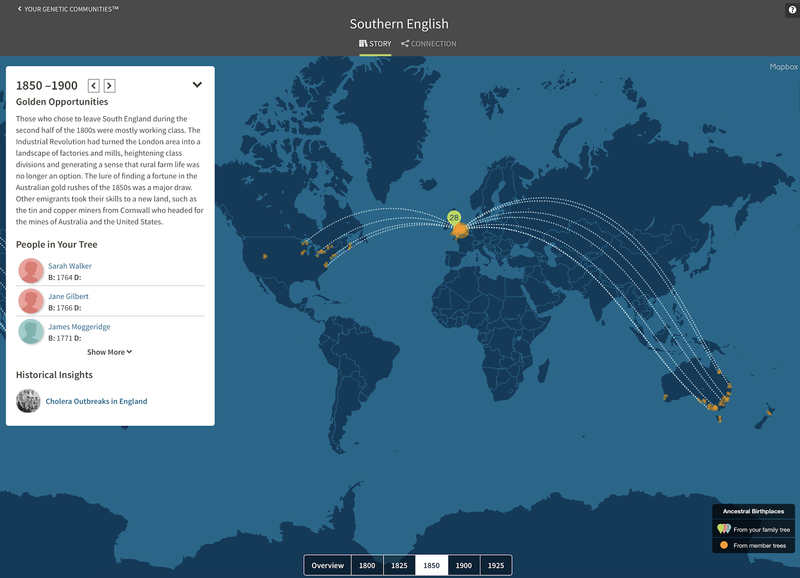 AncestryDNA attempts to provide support for its notion of a ‘Southern English Genetic Community’ with a brief history of the region, noting that in the early nineteenth century London was the largest city in the world, that many people emigrated from London and southern England to Australia, New Zealand, Canada, and the U.S.A. 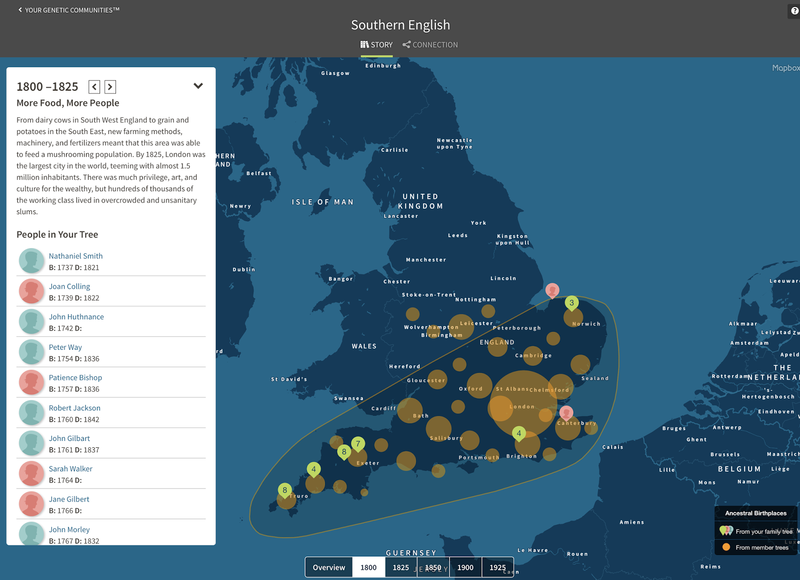 The Ancestry website links people in Greg’s pedigree to the ‘Southern English Genetic Community’ through their birthplaces, broadly indicated on a large-scale map. 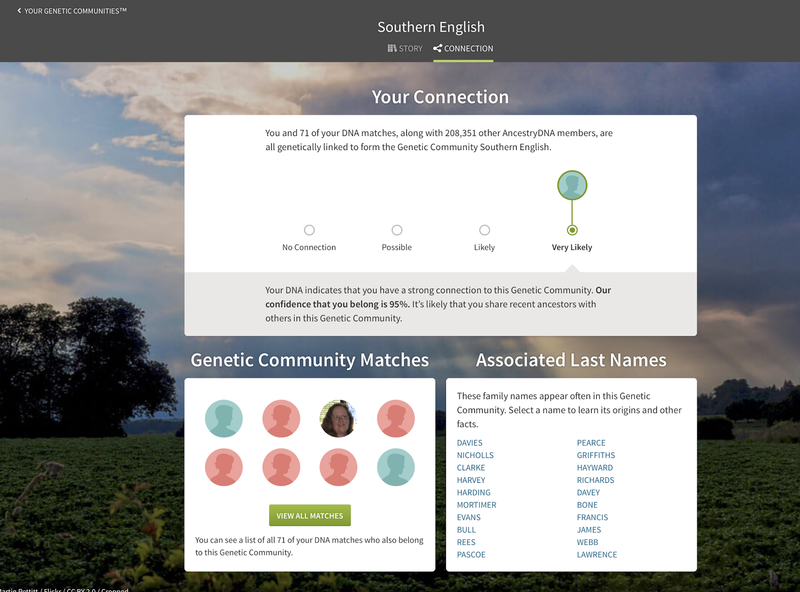 screenshot showing Greg’s family tree data combined with the Southern English genetic community pedigree. Many of Greg’s forebears from Southern England did indeed migrate to Australia in the 1850s and siblings or cousins migrated to America and Canada (Immigration in the 1850s was by sea). 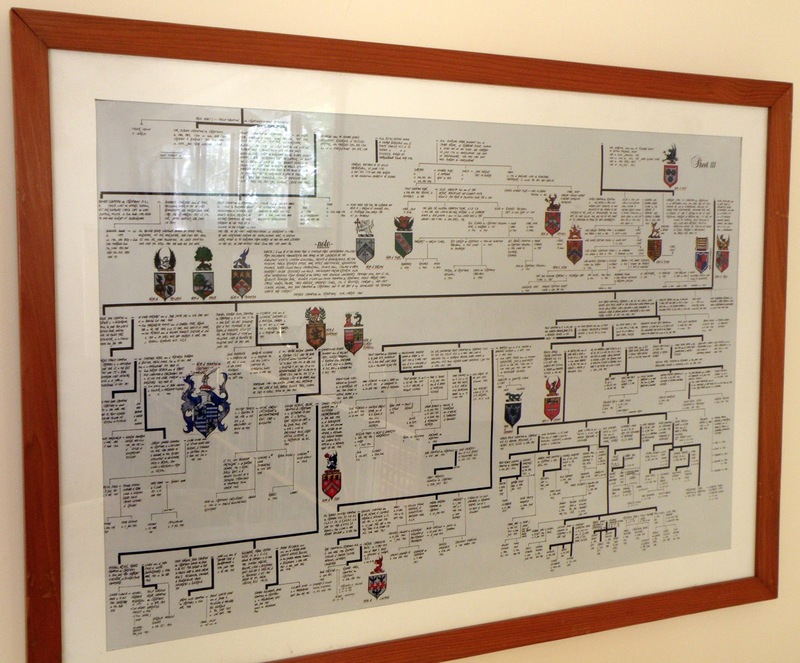 I think that when it is placed in context with genetic relatives and historical events, the ‘Genetic Community’ interpretation of family history specific to our family tree is impressive and convincing. It agrees with what I have found in my own family history research. Greg, however, is being difficult. He says his ethnicity is dinky-di Aussie, and the best thing you could say about all these Southern Poms is that they were (unwittingly) proto-Australians. MyHeritage also provide information about how they calculate the ethnicity estimate: http://helpcenter.myheritage.com/DNA/Ethnicity-Estimate/. MyHeritage compares my DNA with the DNA of living people around the globe whose genetic ethnicity is known and refers to these people as the Founder Populations. MyHeritage claims that they have sampled the DNA of thousands of people and have a data set of more than 100 ethnicities and the ability to show ancestral roots with far greater resolution than any other DNA service. Besides its use in genealogical research, DNA testing is also employed for a simpler purpose: people have their DNA analysed to find out where their family is from, to trace their ethnicity. I thought it might be interesting to compare the ethnicity predictions from my own DNA test results with what I know about my family tree. I have enough tested matches between documented forbears and people with whom I share DNA to be reasonably sure I’m getting it right. My mother is from Germany. On her side of the family five of my great great grandparents were born in Brandenburg, two in Baden-Württemberg and one in Schleswig-Holstein. Based on their occupations, surnames, and religion, I have no reason to believe their immediate ancestors were from other parts of Europe. These results appear to underestimate the German contribution to my DNA mix. I’m not sure why. My genetic ancestry as reported by AncestryDNA on 22 July 2017. The orange region is the genetic community “Munster Irish” which AncestryDNA calculates I “possibly” belong to. I will make that the subject of a separate blog post. (Click on image to enlarge). AncestryDNA and MyHeritage draw different conclusions from the same data. They agree I am 100% European, but differ considerably in the regional proportions. I don’t think these ethnicity estimates are well defined. Where does ‘southern’ Europe start? What does ‘Baltic’ mean? And how reliable are the estimates? Where does the 6% Italian come from? Were some of my English forebears descended from the Roman invaders? What’s the connection between ancient Rome and modern Italy? To me there’s nothing very interesting about the ethnicity results and there’s certainly nothing in them at this time to guide my research. 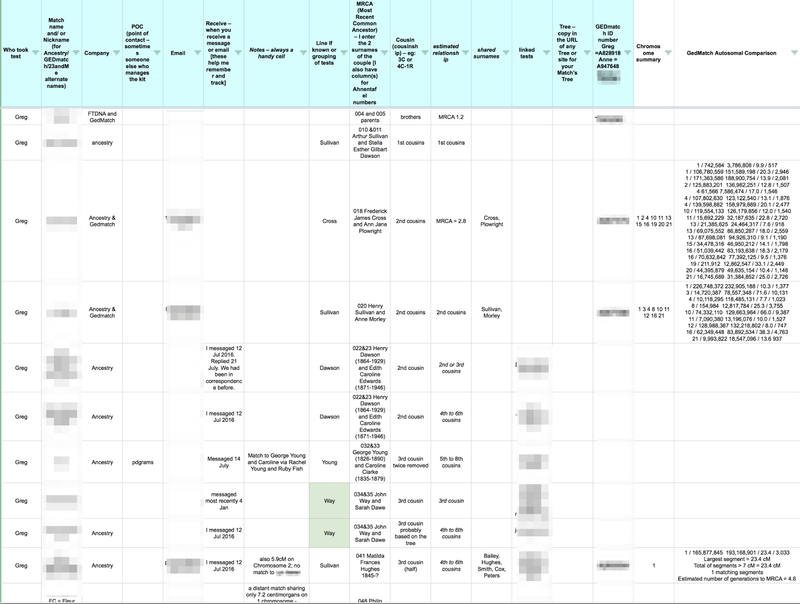 In the year since we received our autosomal DNA results I have explored various tools to help me keep track of the results: to help me find new cousins with whom we share DNA and to show how our document-based trees connect. One of the tools I have used is wikitree.com. Wikitree is a single tree grown using traditional genealogical sources and DNA. 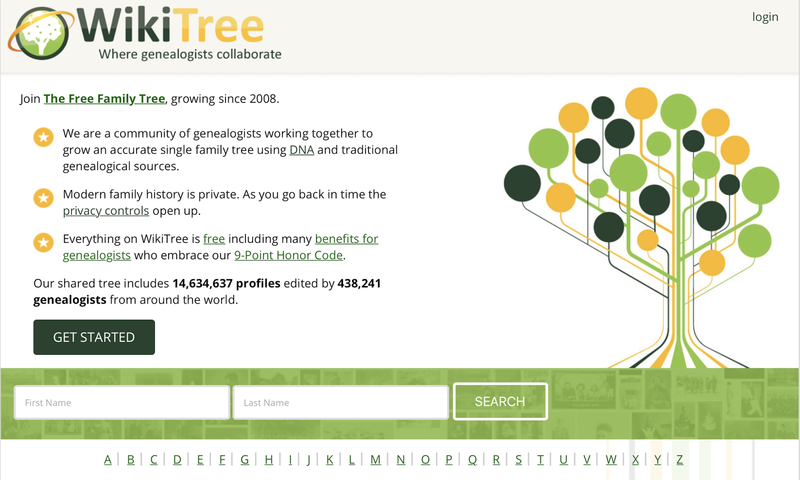 It currently has more than 14.6 million profiles added by more than 430,000 genealogists. Wikitree has some useful DNA tools to help make sense of your DNA results. I have added information about our direct forebears to Wikitree. I added each forebear manually, and this meant revisiting the facts and checking that I had reliable sources for dates, places and relationships. I did not merely upload a GEDCOM file. I wanted to review relationships and I did not want to create duplicates. Wikitree has a single profile for each person. It is important to remember that none of us own our ancestors and we need to work with others on the information we attach to each profile. In fact we benefit from working with other descendants. 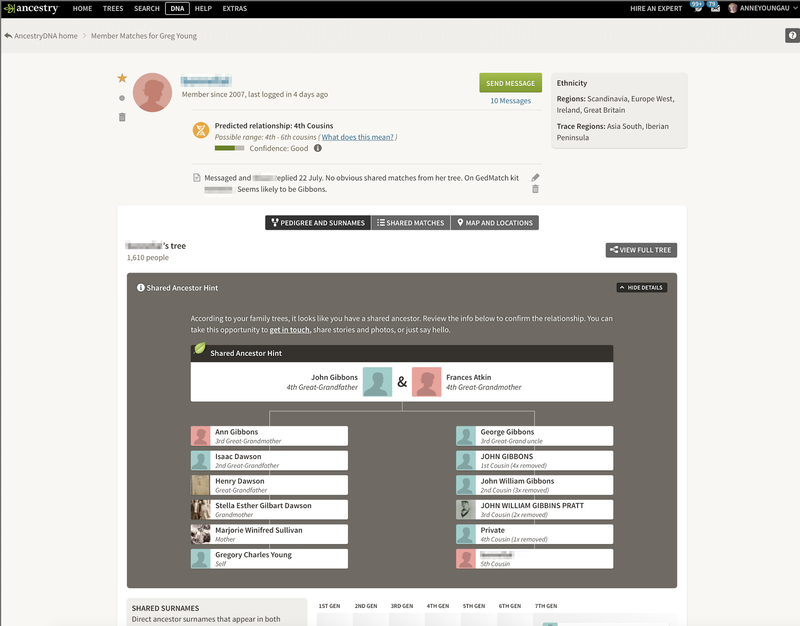 In addition to adding your forebears to Wikitree, you can add details of the DNA tests you have taken. 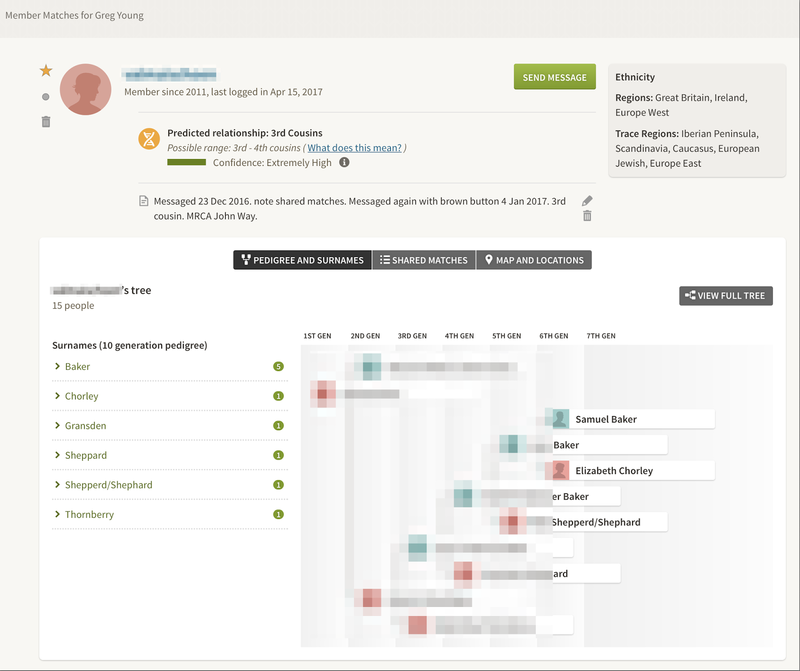 Wikitree adds the information that you have taken the test to all blood relatives within eight degrees of separation — up to sixth great-grandparents and out to third cousins. You don’t upload the contents of the DNA results, just the fact that you have taken the DNA test and information that will help potential matches find you in each testing company’s database. Recently I was contacted by Simon Bass, a distant cousin, who has also been adding his forebears to Wikitree. (Note Simon reviewed this post as a draft and following publication and is happy for me to blog about this case study.) Simon has found that he seems to have a DNA connection to my husband’s family. Both my husband Greg and Greg’s brother Dennis have had their DNA tested and added their information to Wikitree. Simon is descended from Elizabeth Gilbart née Huthnance (abt 1774-1847) and her husband John Gilbart (abt 1761-1837). 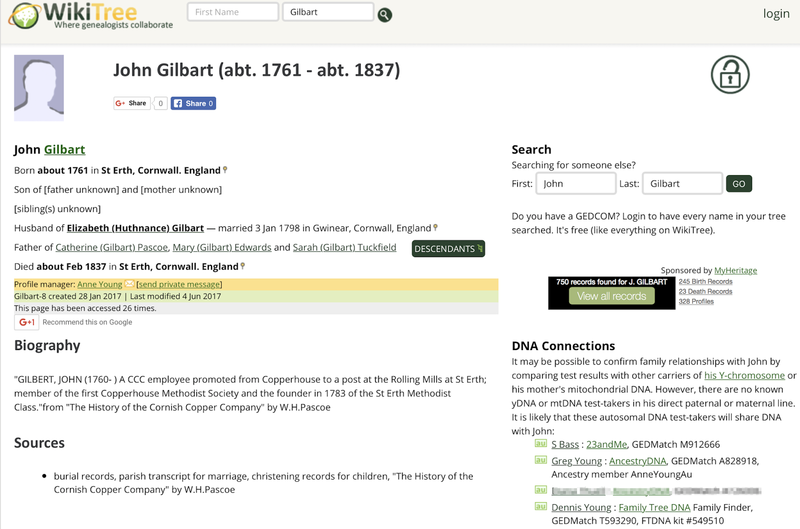 When adding their daughter Catherine’s details to the tree, linking Catherine to Elizabeth and John who were already on the tree, Simon noticed that Wikitree had a section on DNA connections on the right hand side of the screen. Simon wrote to me and, despite testing with different companies, we were able to compare our kits on GedMatch.com . Our biological cousinship was confirmed. GedMatch.com provides DNA analysis tools for genealogists including tools for comparing your own DNA test results with those of other people in the GedMatch public database. To use these tools you must first upload your DNA test results to GedMatch. GedMatch accepts results from Ancestry.com, Family Tree DNA, MyHeritage, 23 and Me, and WeGene. GedMatch one to one comparison of DNA shared by Simon Bass and Dennis Young. Simon and Dennis share DNA on two chromosomes. Based on the size of the match it is estimated that there are six generations to their most recent common ancestor. Their relationship based on our document-based family tree is 5th cousins which is six generations to the most common recent ancestor, the prediction based on shared DNA is in line with our genealogy. Since this first exchange of information Simon has shared photos with me of his trip back to St Erth in Cornwall, where the Gilbart and Huthnance families came from. We have also exchanged notes on the emigration of various members of the Gilbart family to Australia. 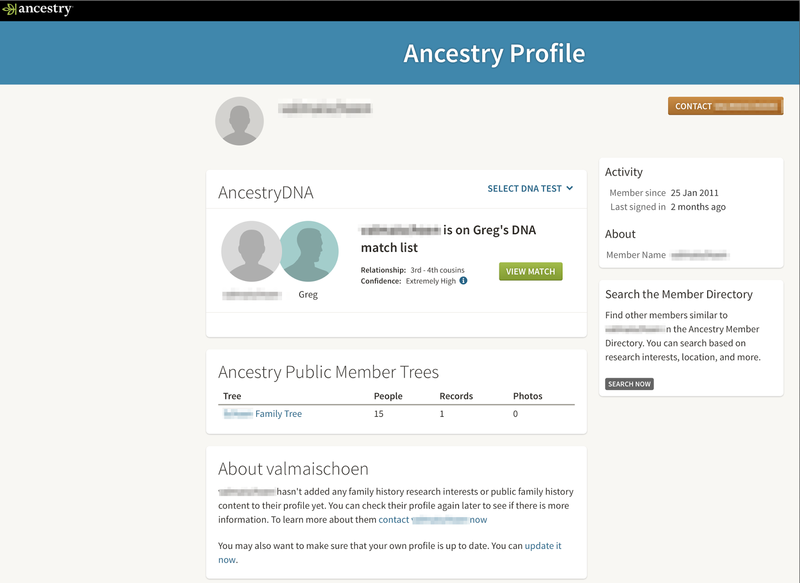 Wikitree made it easy for us to see that our document-based trees connected and showed that we had taken DNA tests. Having uploaded our test results to GedMatch.com, we could compare test results and see if there was a likely biological connection. If there had been no shared DNA it would not have disproved that there was a relationship. It just meant that the same segments of DNA had not been inherited by Simon and his cousins Greg and Dennis. Simon, Greg and Dennis are 5th cousins since they share 4th great grandparents. There is a nearly 70% chance that any two fifth cousins will not share a detectable level of DNA. ( https://isogg.org/wiki/Cousin_statistics ) In fact Greg’s brother Dennis shares DNA with Simon but Greg does not. To see what DNA testing might show about our family history, in June last year my husband Greg and I submitted samples of our DNA to Ancestry.com for autosomal DNA analysis. Greg also took a Y-DNA test through the Family Tree DNA company. What did I hope to learn? I had no particular questions about my side of the tree that I thought DNA tests might answer, though I did hope that I might find some of my relatives on my mother’s side who, I had been told, had emigrated from Germany to the USA. My mother was born in Berlin. After WWII when there wasn’t enough to eat, food parcels addressed to her family began to arrive from the United States, sent—she was told—by her American cousins. When I talked to her about my DNA testing she was a little sceptical but she thought it would be interesting to trace her American relations. On Greg’s side of the tree there were some dead ends that I hoped DNA analysis might provide a way around. 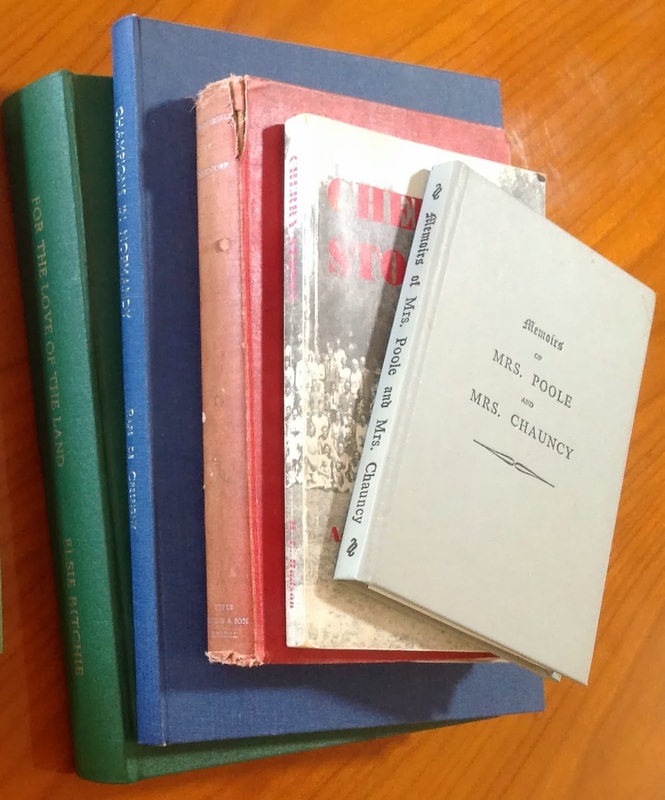 In May 2016 I blogged about these in a post [Poor little chap], with a hypothesis about the parents of Greg’s great grandfather Henry Sullivan (1862-1943). When our test results came back I quickly found some meaningful matches on Greg’s tree. 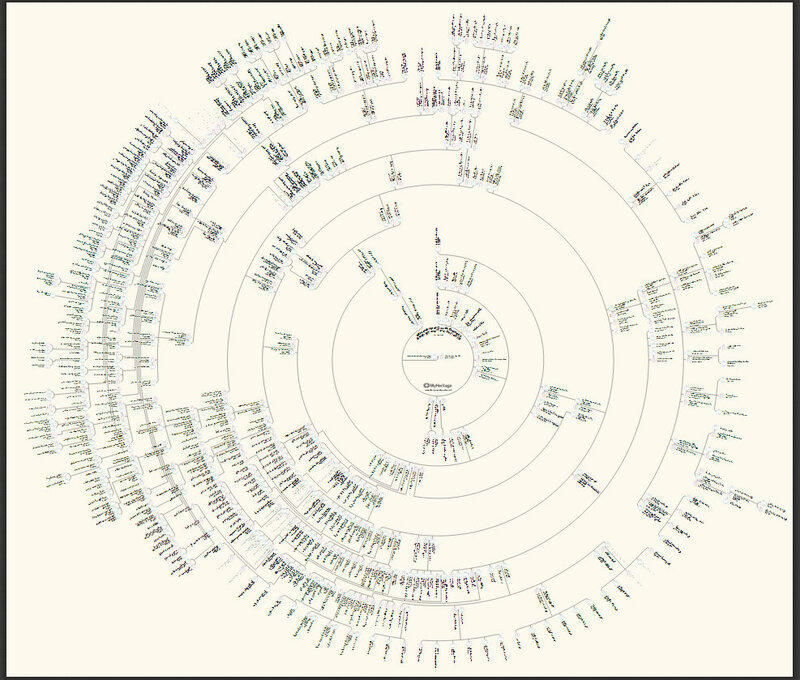 Some of his cousins had tested too, and we were able to make links between our pre-DNA trees and the DNA information. I started a spreadsheet to record these matches and, to confirm the links I had found, I sent messages through AncestryDNA’s system to people who appeared to have matching results. I also used the ‘Notes’ field on AncestryDNA when I had contacted the match and added a star to matches so that I could see at a glance who I had contacted, when I contacted them, and the likely match. 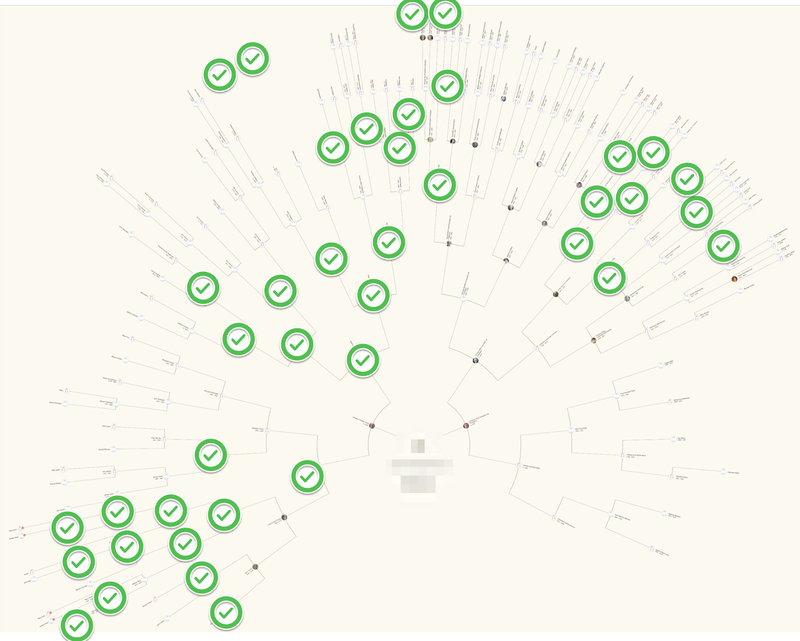 A screenshot of an AncestryDNA match where our trees correspond and the most common recent ancestors are identified. There is a yellow star on the top left hand side of the screen which can be used to identify matches of interest. The notes field in the middle of the screen can be used to summarise contact, GedMatch numbers and likely shared ancestry. 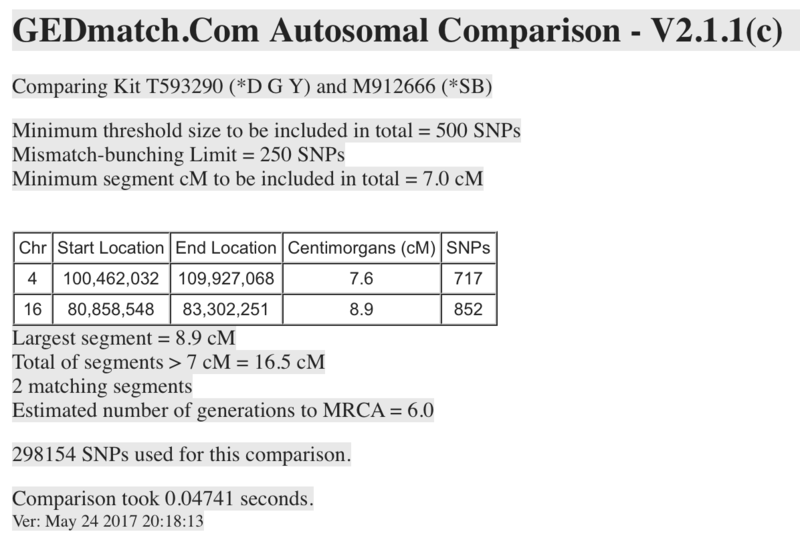 A screenshot of a DNA match where our trees on ancestry do not intersect. In fact I have identified the most common recent ancestors through correspondence with another cousin and shared DNA. Although I messaged using the green “Send Message” button in the top right hand corner, the cousin did not reply. I also unsuccessfully used the brown “Contact” button on the top right of the screen for the Ancestry Profile – see screenshot below. Initially my DNA matches meant nothing to me. There seemed to be little connection between my DNA matches and my document-based tree. However, over the last year I have received replies from people we share DNA with, and have been able to compare our family trees and determine where they intersect. For many of these matches, I have been able to draw some conclusions as to our likely most recent common ancestors, particularly when several of us share the same DNA and have intersecting document-based trees. So far we have more than 30 matches where we can identify the most recent ancestors we share. DNA has added to the evidence I have used to build and document my family tree. To date I have not found any DNA-based evidence which suggests my document-based tree is inaccurate. Unfortunately I have yet to find any cousins sharing DNA on my mother’s side of the family. The Legal Genealogist observes in her post of July 2 2017 That YDNA lament “you can’t be matched to somebody who hasn’t tested” and that there are good reasons for the lack of German DNA matches to date. Jill Ball has suggested writing about five books especially useful in your family history research. 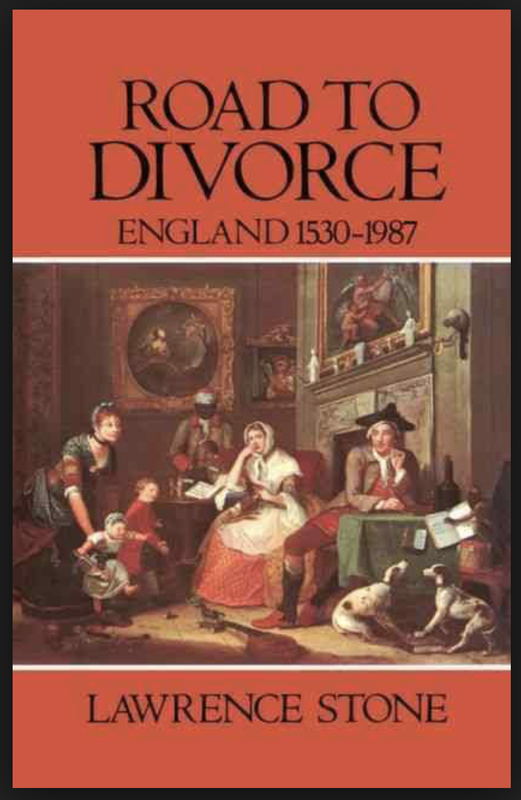 One of my favourites is the Road to Divorce: England 1530-1987 by Lawrence Stone. Stone’s insights on marriage and divorce at different times in history have helped me enormously. I referred to The Road to Divorce extensively when I was trying to understand the 1849 divorce of my great great great grandmother Charlotte Champion de Crespigny née Dana formerly James. In those days divorces were heard in two courts, the Court of Arches plus a suit for criminal conversation brought before the Queen’s Bench, and also required an Act of Parliament by means of presenting a private bill before the House of Lords. It was extremely expensive to go through the process, and there were only about four divorces a year in England. 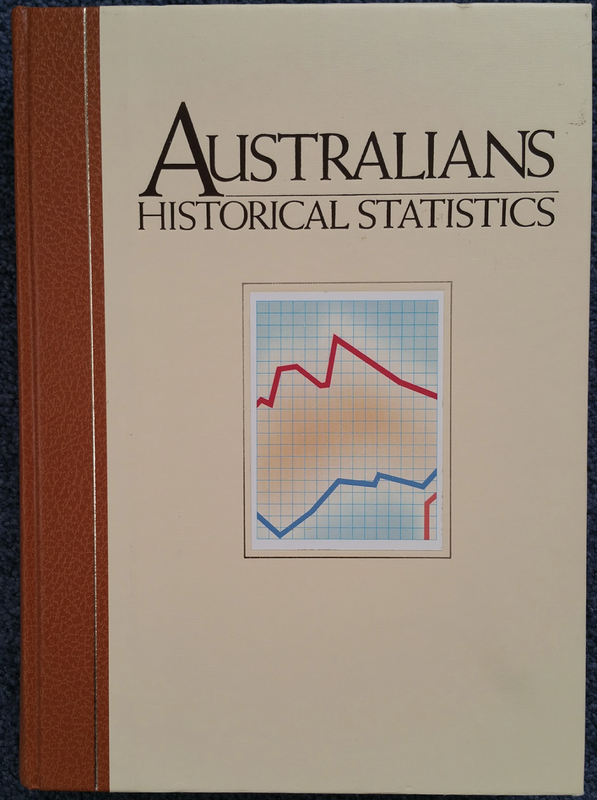 In 1987 Fairfax, Some and Weldon published Australians: A Historical Library. 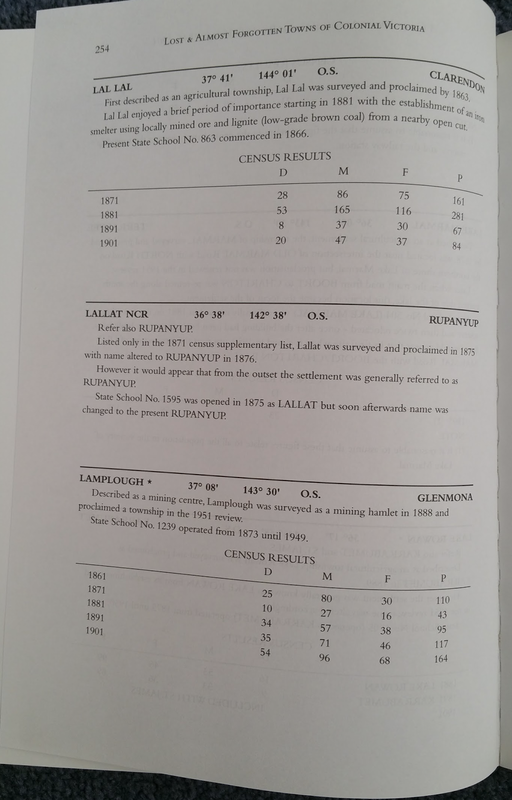 While there have been criticisms of the series, for example a 1988 review by Jenny Lee, I have gained a lot from the Historical Statistics volume edited by Wray Vamplew and to lesser extent to of the Events and Places volume. 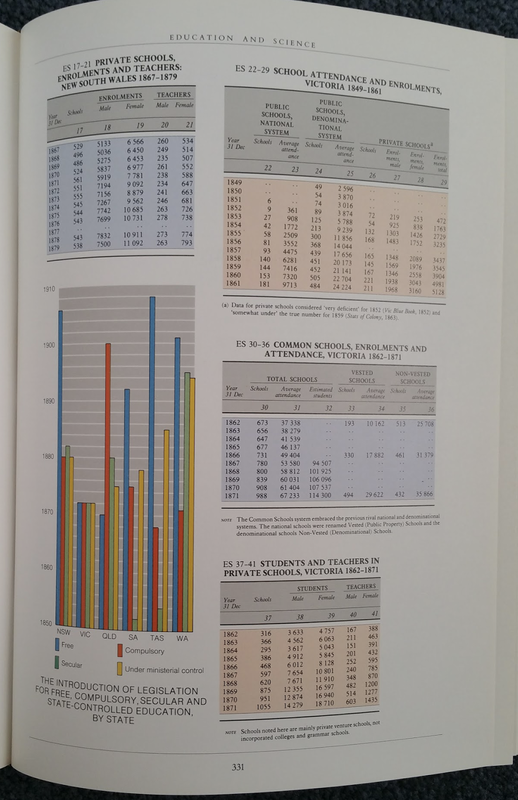 The statistics volume was useful to me when I was trying to understand more about the age at which women marry. 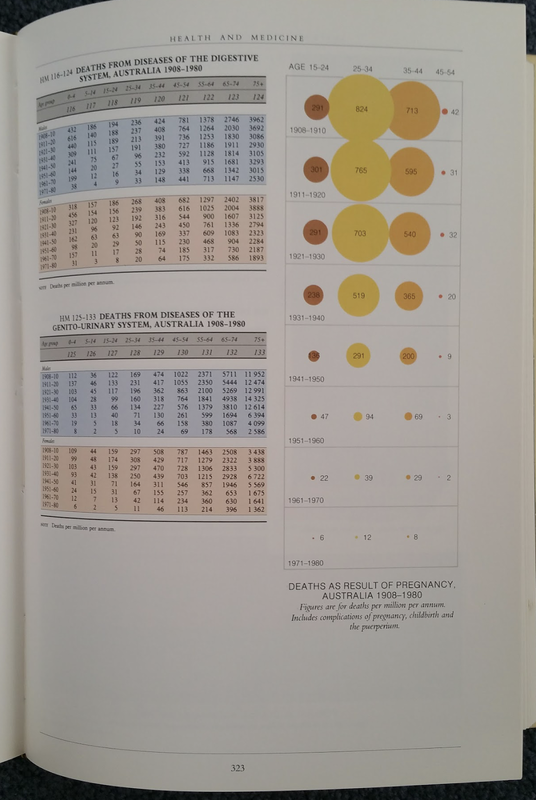 A most encouraging statistical picture of the reduction in the deaths as a result of pregnancy between 1908 and 1980 (click on image to enlarge). 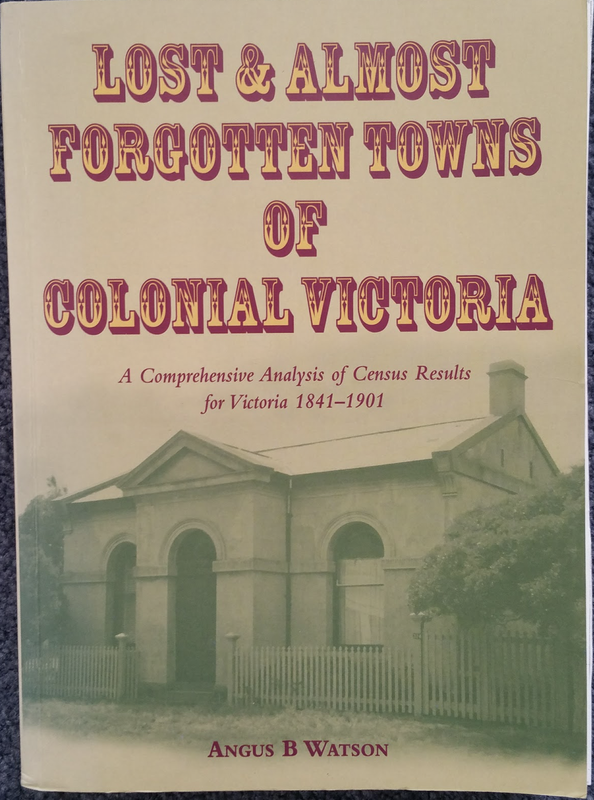 I have often referred to Angus Watson’s Lost & Almost Forgotten Towns of Colonial Victoria. I cited it in my post on Carngham. I bought this book direct from the author some years ago. It is now selling on-line for five times what I paid for it. I think reading about the context of our ancestor’s lives can be most illuminating. At the moment I am reading London in the 18th century: A Great and Monstrous Thing by Jerry White. I borrowed it first from the library in an attempt to curtail my spending on books – but had to own it, it is so full of information and well written. 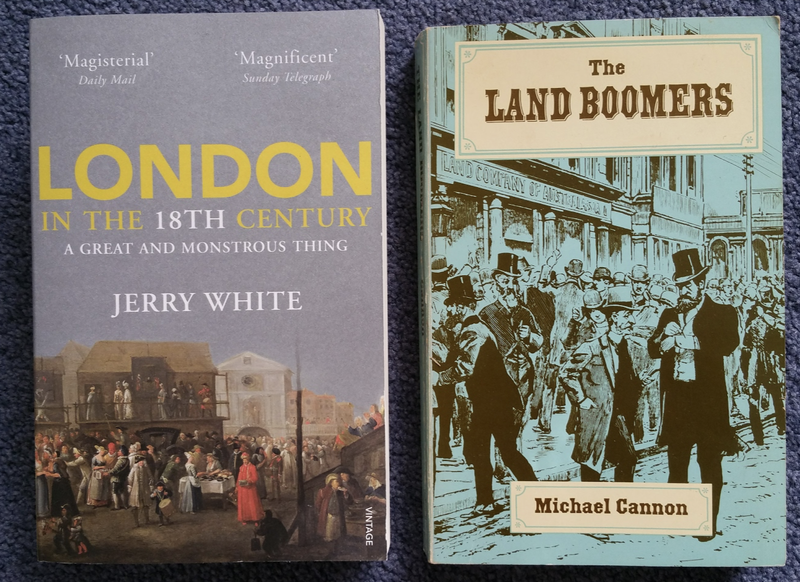 My husband Greg is reading Michael Cannon’s The Land Boomers which was passed recently to me by my father. He says it is fun. My turn next. I constantly refer to the family histories written by my relatives. As a way of passing on family history, nothing beats a book! 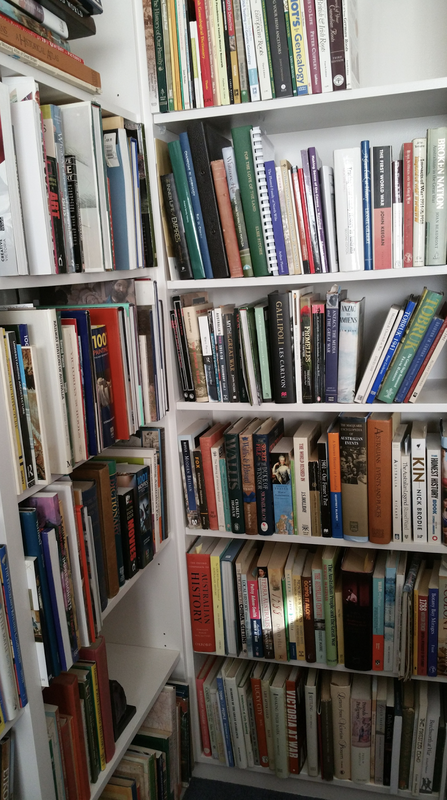 I use LibraryThing to keep track of my books and the books in my study are organised by the Dewey system. So many books! So much reading! Steedman, C. (1990). Vomiting in the marital bed. [Review of the books Road to Divorce, England 1530-1987 and Late Victorian Britain, 1875-1901.] London Review of Books, 12(21), 13-16. Retrieved from https://www.lrb.co.uk/v12/n21/carolyn-steedman/vomiting-in-the-marital-bed. 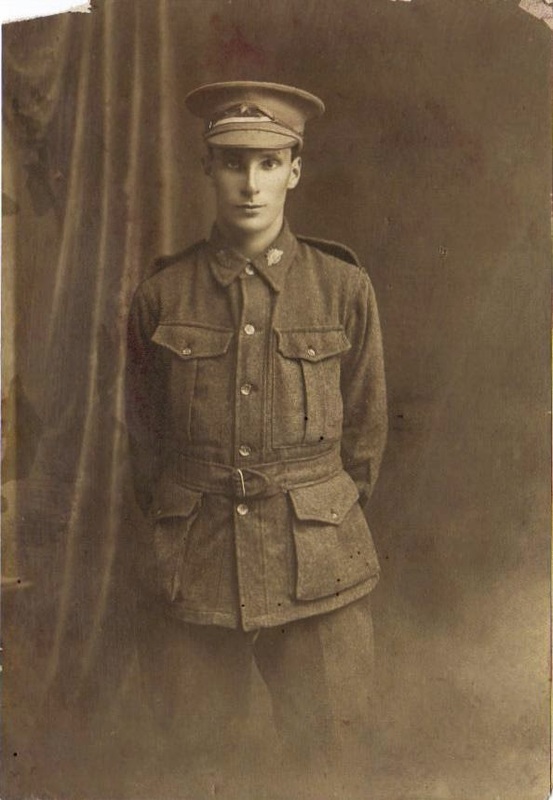 Leslie Leister (1894-1916), the half-brother of my husband’s grandfather, was one of the 250 soldiers who were killed at the battle of Fromelles in July 1916 and buried in a mass grave by the Germans after the battle. After the battle many men lay dead in the area occupied by the Germans. It was summer and the rotting bodies had to be dealt with quickly so the Germans buried the dead British and Australians in pits near a wood. The Germans sent the identification tags of the soldiers they had buried to the Red Cross so relatives could be informed. Leslie Leister’s name was on the Red Cross list. Although many bodies were recovered after the war and reburied in Imperial War Graves Commission cemeteries, the bodies in the graves at Fromelles were not. Lambis Englezos, an amateur historian from Melbourne, began a project to identify the grave site. Eventually he convinced the Australian government to commission an excavation and the bodies were located and reinterred, with DNA samples taken for identification. 124 soldiers have been identified using DNA, forensic science and historical data. In February 2009 my husband Greg received a phone call from a researcher and former police officer, Tim Lycett, about the excavation of the soldiers from the Fromelles battlefield. Although there had been several news stories I hadn’t paid any attention because at that time I didn’t know there was a family connection. Tim worked with other researchers, including a genealogist called Sandra Playle, to identify men who might be buried in battlefield mass graves. 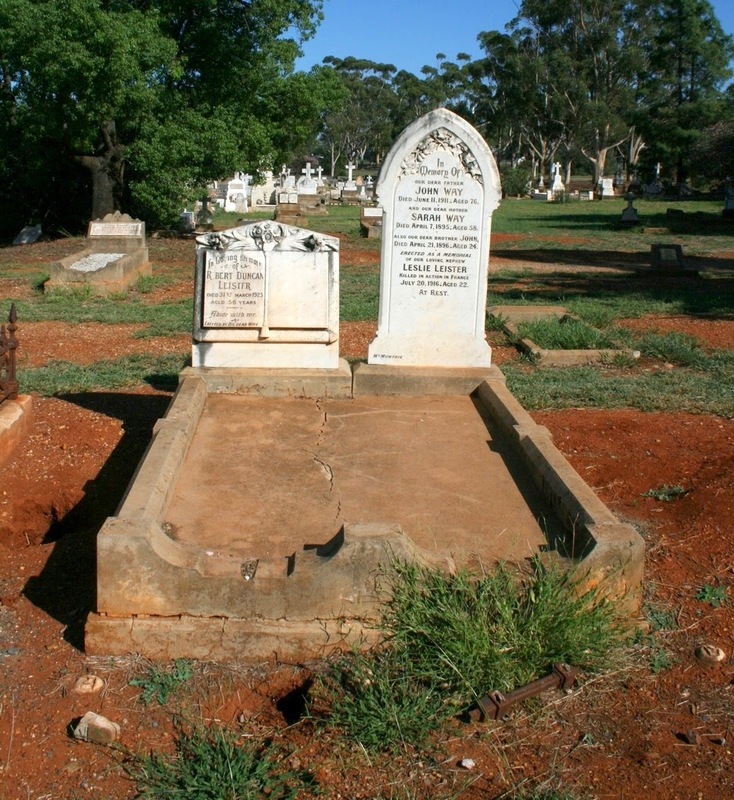 We had seen the gravestone of Greg’s great-great-grandparents, John and Sarah Way (1835-1911 and 1837-1895), in Parkes cemetery. Their grandson Leslie Leister is mentioned, but as a nephew. Beside the Way grave is the grave of Robert Leister (1871-1925) and we assumed that Leslie was a nephew of Robert’s and did not understand that he had a more direct connection to the Way family. Gravestone at Parkes photographed March 2009. The inscription reads: In memory of our dear father John Way died June 11, 1911: aged 76. And our dear mother Sarah Way died April 7,1895. Aged 58. Also our dear brother John, died April 21, 1896, aged 24. Erected as a memorial of our loving nephew Leslie Leister killed in action in France July 20,1916. Aged 22. At rest. Greg’s great-grandmother Sarah Jane Way (1863-1898) married twice. Her first husband was Robert Whiteman, by whom she had two children. He died of pneumonia in 1884. Ten years later she married John Young (1856-1928) in Melbourne. Sarah Jane had also had a third child, Jack Walsh [Whiteman] born on 13 August 1894 at Parkes in New South Wales, just weeks before her marriage to John Young. The child’s father is not recorded on the birth certificate. Leslie Leister was brought up in Parkes by Sarah Jane’s sister, Eliza (1865-1940), who married Robert Leister in 1896. The information to trace the family history is there in the World War I dossier, NAA:B2455, Leister Leslie. In his letters to the Defence department, Robert Leister always refers to Leslie as his wife’s nephew. The linking document is a letter from the Mutual Life and Citizens Assurance Company at folio 52 which refers to his birth name. Without that information we might never have identified him. We believe this is a photo of Leslie Leister. It was in a family album and Leslie is the only soldier who fits within the family tree who is not otherwise identified. Leslie enlisted on 2 October 1915 at Holsworthy Barracks near Sydney. He had been working as a postal assistant at Lambton, Newcastle, New South Wales. On 8 March 1916 he embarked for Egypt on the troopship HMAT A15 Star of England. In 21 April 1916 at Ferry Post, on the Suez Canal, he was transferred to the 55th Battalion. On 29 June he sailed with the 55th on HMHT Caledonia from Alexandria to Marseille. On July 19 he wrote to his adoptive parents from “somewhere in France” that he was quite well. Robert and Eliza Leister received that letter on September 9. On July 20 Leslie was dead, killed at Fromelles. Photograph from the Australian War Memorial image id A01562. Unknown photographer. Portion of the German 2nd line held by the 31st Battalion, AIF, throughout the night during the Battle of Fleurbaix which took place on 19 July 1916 and 20 July 1916. Note the attempt at consolidation. This photograph was taken during the morning of the 20th July whilst the Germans were re-occupying their old position. Note the three German soldiers at rear. 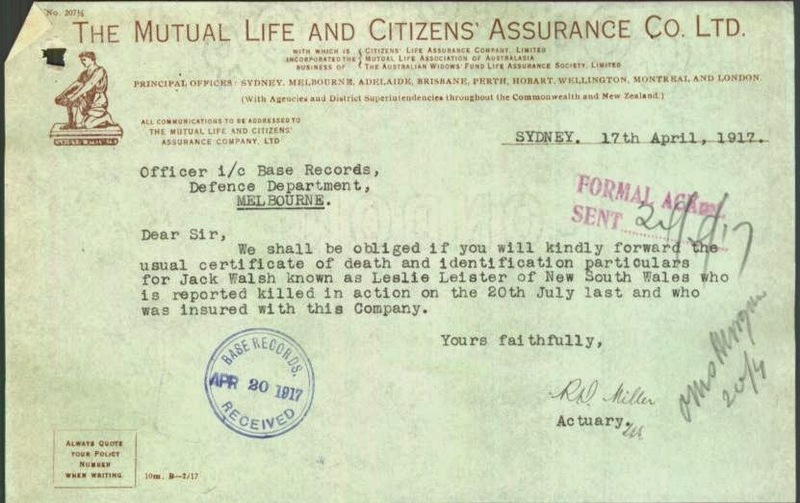 Retrieved from https://www.awm.gov.au/collection/A01562/ https://www.awm.gov.au/blog/2008/07/18/the-worst-night-in-australian-military-history-fromelles/ : For a long time afterwards many would refer to the events about to unfold as the battle of Fleurbaix, but eventually the name of Fromelles stuck and today it is by that name that the battle is known. Leslie Leister is one of the soldiers who was identified. His grave in the new cemetery is marked with the same inscription as his grandparents’ grave at Parkes.